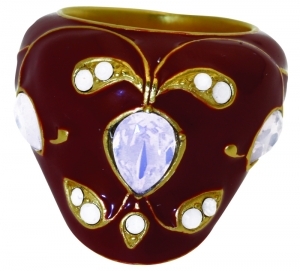 V&A Jewellery: This ring is inspired by a magnificent gold thumb ring made in the Mughal empire in the 18th century. This ring is gold-plated and hand enamelled with SWAROVSKI ELEMENTS. This piece is inspired from an object in The Victoria and Albert Museum, London. V&A Jewellery - Eight-star Ruby Crystal ring: Inspired by a mid-1800s gold ring set with a brilliant-cut diamond in a silver claw mount. V&A Jewellery - Turquoise Tassle Necklace: This necklace consists of turquoise and gold-plated bell shaped tassles which move individually with the wearer, fashioned after the style of a West European design dating from 1835-1840.